In the 1960s and 1970s clocks were objects of high style, designed to add a finishing touch to any modern contemporary home. They took on a similar style to the furniture and decor favoured at the time. In the fifties, clocks reflected the early contemporary style, in the 60s as this style evolved, so did the look of clocks used in the main rooms of the house. As Scandinavian style furniture became popular, so teak became a fashionable look for clocks. The sunburst clock is a retro clock that really makes an impact. The example above is from the 60s. It was made by British clockmaker, Metamec. Metamec produced some of the most stylish clocks of the 50s and 60s. This example would have complemented a modern style home in the 60s. 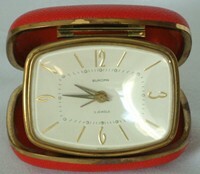 The sunburst clock, right, is a later model from the 70s. It uses teak wood for the sunburst effect. This fitted in well with contemporary home decor. Modern was the favourite style of clocks from the 60s. Although a variety of styles were available, a clock was still something people expected to perform and one way to express this was a modern design. The ultimate expression of modernity in 60s clock making was an electronic movement. This Smiths Sectronic, from 1965, right, has a transistorised movement. In the days before quartz clocks, electronic movements were the most accurate and did not have to be wound up every day, or every seven days for clocks with eight-day movements. With its origins in the pre-war Art Deco style, the Sunray clock still sold well in the 60s. In spite of the popularity of modern and contemporary styles, this Smiths electric version, right, has a dial with Roman numerals. 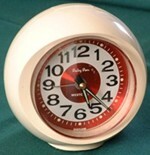 This type of clock was often seen in bank managers' offices in the 60s or in more traditionally styled homes. The sunburst clock was an update of this traditional clock style. Metamec Ltd started trading in 1944. The link with furniture style and clock style was strong at Metamec, as the Company was owned by the furniture manufacture, Jentique. Metamec clocks were fashionable accessories in modern style homes. Metamec also started the manufacture of quartz movements in the 70s. However, it failed to survive difficult times in the 1980s and went into receivership in 1984. This Metamec clock, left, from the late 50s follows contemporary furniture design. The light wood finish was very much in vogue and the clock itself has 50s contemporary splayed legs. This clock would have perfectly complemented G-Plan's original Brandon range in light oak. These clocks were also available in darker wood as an alternative, just like the furniture. This model, also from Metamec, is from the 60s. It uses a popular modern design motif - the eye. Finished in mahogany and black with brass fittings, this clock would have ideally complemented an early 1960s interior furnished in the popular Tola and black furniture. This selection of clocks, left, from the mid seventies shows the popularity of modern style clocks with a distinct sixties' look. However, they have been joined by the ubiquitous carriage clock, which was a popular addition to many homes in the 70s. There are also some more ornate clocks and a miniature grandfather clock. The appearance of some of these reproduction antique styles suggests that the clock's function was taken for granted, so there was no need for it to appear modern, unless that fitted in with the decor in the house. The battery operated anniversary clock, above right, has a glass dome covering the movement, which includes four brass balls. These rotated, giving the impression of a complex mechanical movement. This style of clock enjoyed a brief spell of popularity in middle class homes in the 70s. Another retro style from the 60s and early 70s was the frying pan clock, left. There were also clocks made to look like warming pans. This type of clock was a popular feature in the suburban dining room or kitchen-diner in the 70s. A revival of an old fashion for alarm clocks with external bells meant a loud wake up call for heavy sleepers in the 70s. This clock, right, from Smiths was on sale in 1972. Its retro design sold well and I can remember seeing large numbers of this type of clock for sale in Woolworths in the 70s. The Wextclox Big Ben, left, was a classic alarm clock that generations of people have woken up to since 1909. It has been restyled several times since that time. The clock, left, is a retro style version from the 70s. Westclox still manufacture a replica of a 1930s version of the Big Ben. The Westclox Baby Ben, right, was a small version of the classic Big Ben alarm clock. This 70s clock has been given a special, cool look for the time - it appears to resembles an eye. This Europa travel alarm clock, left, from the 60s is typical of the kind of clock people would pack in their suitcase for a trip to the Costa del Sol. It was a wind up clock with an alarm. This model is made in Germany, but these clocks were also made by UK manufacturers Smiths and Westclox. The rounded rectangle shape dates it to the sixties. More compact designs were available at the time, but were quite expensive. Read more about vintage travel alarm clocks. 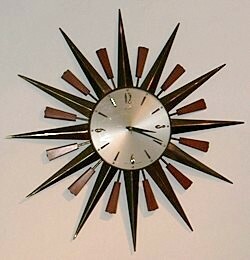 "Hello I have a metamec 1970's sunburst wall clock like the one in the phot on your website. It needs a new mechanism. Do you know how or where I may get one fitted so it runs to time please?